This morning started out bleak. I woke up to the rain on our window A/C and had a headache. I got out of bed and took some Excedrin Migraine since I couldn’t find regular Motrin, and I like to take it just in case. I went back to bed (and set an alarm since apparently I forgot!) and within 10 minutes I knew it was actually a migraine not a headache. I got out of bed and started doing all my cures so I could go flying. I gave my instructor the heads up I wasn’t feeling well and I’d keep him updated. I soaked my feet in hot water, put an ice pack on my head, and then fell back asleep for a bit. At 9am, I felt better and the weather was clearing up. I texted my instructor that it was looking good and headed on my way. He picked me up at the train station and we caught up since it had been a week since I saw him. We had to wait a few minutes for the plane to come back since we were early. 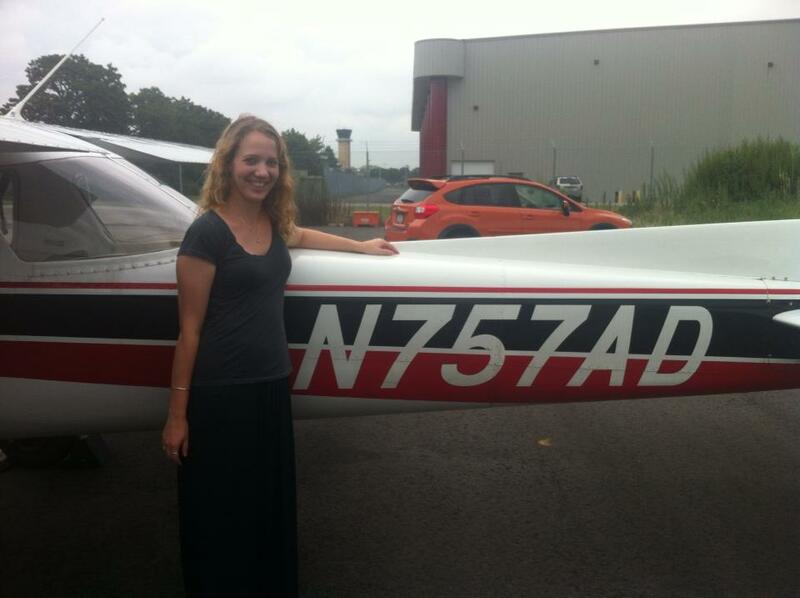 I got to meet one of the other owners and another student who was getting ready to solo as well. The other student and I talked for a bit and then they left and we got the plane ready. I had to ask how to raise the seat since I couldn’t figure it out and was excited to try it! Raised it to the highest position and started taxiing to the runway. The pattern was quiet. It was my least favorite controller again. The first time she cleared a Gulfstream to take off as I was turning a mile final so I was forced to go around. My instructor was so happy how I executed the go around. A whole bunch of people got cleared to land so I was extended out a good ways. That first landing was a greaser! Second landing, the exact same! WHAT?! I was rocking it. Everything was perfect and smooth at every point. My instructor was excited for me. I felt like I was doing NOTHING different, but just the different visual was all I needed. I told him that. I also commented that I use to feel on landing a bit worried when I was too fast, but now I wasn’t. I knew I could bleed off the airspeed if I was too fast. I wasn’t worried anymore. Third through sixth landings were all safe and pretty good. Always better than what my landings have been. On the climb of the sixth, my instructor asked how I felt about soloing. I said I wasn’t nervous. On the downwind, he said make it a full stop and he was getting out! I just smiled and said “okay.” I felt ready. Everyone is asking me, “were you scared?” Surprisingly, not one bit. I knew I could do it. It was a much better feeling than wanting to vomit every time I thought about soloing. He explained what I was to do. Get the ATIS, do a run up, and do 3 landings. He would be on the hand held if I needed him. He shook my hand and got out. People say you talk to yourself when you solo. I didn’t really say out loud what I was doing, but I totally was like “oh my god, I’m doing this!” There was another student in the run up area, they were in front of me but took too long so I cut in front of them after trying to wait. I forgot to request touch and goes with Ground so Tower wasn’t too happy after my take off when I asked left or right traffic. Oh well. First landing: great! I may have done a “whoooo” after taking off again. Second landing: Good, a bit hard but on the center line. Third landing: GREASER! I hardly felt it. I told myself in the air after the second one “Make this one count, Caitlin!” And I did. The pattern was quiet and these were so fast. The winds were calm, but bad weather was on the way. There was also another student at the same school soloing as well. After I got off the runway, I saw the other owner I just met standing on the Echo ramp. I waved furiously because I was so happy and he gave me the thumbs up. During my taxi back, I felt close to crying. I know, such a girl thing. But I was unbelievable happy and proud of myself. I didn’t think this day would ever come. Just after being through so much and having so much frustration, it was amazing to finally accomplish this. I saw my instructor driving his car back to the tie down spot. I followed. He took pictures with his phone of my taxiing in. I got out of the plane and he came over wanting to shake my hand, I insisted on a hug. The fuel guy was coming so we quickly pushed the plane back so he could refill the tank. I was putting the gust lock on the rudder and the fueler came over to my instructor and said “she’s ready!” and he responded “she just did it!” and he said he saw it and how good it was. That was Winston, he seemed awesome. He spent some time saying how he sees lots of students solo and thought I did better than a lot of them. He also welcomed me to the “club.” I enlisted him to take pictures of my shirt cutting. My instructor originally didn’t want to cut my shirt because he didn’t want me riding home with half a shirt. I told him my skirt was high-waisted so go ahead. I’ve been wanting my shirt cut and have been wearing older shirts, just in case. He signed all my logbook stuff and medical and I got to fill out my logbook for the first time! He drove me back to the train and we talked about what my next lessons would be. I recently noticed “aviators” is spelled wrong on the plane in this picture, my next lesson though it was fixed though. I called Jake right away to tell him the good news. He was shocked it was today and a little disappointed he wasn’t there. I called my mom afterwards, I figured I should tell her than her see it on Facebook and freak out. She desperately wanted to sound excited, but just ended up sounding terrified. I texted my old instructor as well because she said she wanted me to keep her updated and I thanked her for all she did and wanted to let her know that even though things didn’t work out I appreciated all she did. She also apparently was in a King Air behind me on one of my touch and goes. 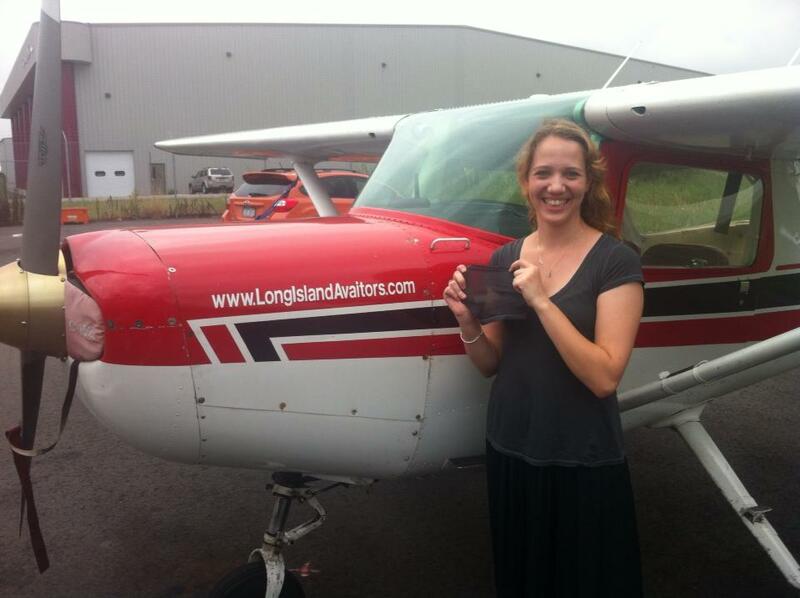 I SOLOED! I’m so happy and beyond thrilled. This is the best feeling in the world. I kept looking over at the empty seat and enjoying it. I wanted to keep going and not stop after three! Oh yeah, and I did it all in a skirt. Outstanding!!! Just the best feeling isn’t it? I guess the next best one is when you land after passing your test. Great job, great being along for the ride!! It is! Now it’s just starting to feel surreal. I need to do it again! I can’t wait for that landing, hopefully it won’t take another 5-6 months. Thanks for joining along and your comments along the way! I’ve been waiting for this post for a while – congratulations, I’m so happy for you! My instructor did the same thing – I don’t think they like to tell you for certain when they’re going to let you solo, partly because you never know, they might get you on an off day where you’re just not performing 100%, and they don’t want to get your hopes up, or put pressure on you. But there’s nothing like that first moment where someone who knows piloting has enough faith in you to let you go up in a flying machine and trust that you can get it back on the ground safely. Except maybe the moment your instructor recommends you for your flight test 😛 Hold onto that feeling today, that your instructor knows you can do this, and use that to fight the nerves when the flight test time comes. I know how uncertain of myself I was at test time, and I had to just trust that my instructor knew what I was capable of better than I did. I’ve been dying to write it for a long time! Well, I think my old instructor always telling me it was 1-3 lessons away just put a lot more pressure on me. This new one never mentioned a word about soloing until the climb out of the 6th take off. I liked it much better. I know when I was getting close to it, I wanted to know how close I was, but I was afraid to ask, worried that the answer would be no, you’ve got some time to practice yet. But then, when my medical didn’t come through right away, then my instructor was switching to working on other things besides landings, moving on to the next part of training that normally comes after a couple of hours of solo practice, so I was hoping that meant that she thought I was ready to solo, and didn’t want to waste time practicing things I had down. So she did it pretty much the same as your new one, not telling me when it would be. I usually perform at my best under pressure, mind you, but at the point where I did my first solo, it wasn’t as if it was unexpected. When you first fly, you learn to have faith in invisible forces. By your first solo, you’ve learned to have faith in yourself. That’s so true! Nice words. It’s definitely that confidence thing we were talking about earlier. I’m glad I finally got it completely! Congrats! Hopefully my son is right behind you. He is at 17 hours. You’ll never forget the day Caitlin. Congrats! I’ve followed your blog from the start. As I mentioned before, I’m a CFII and have been using your blog to reacquaint myself with the feelings and emotions of a student. It’s helped me to be a better instructor. A few months ago I took a corporate flying job in the Citation 560. The transition training was humbling. I was sort of like you for a few hours. Glad to say it feels comfortable again. Your future solo’s will feel comfortable as well. Thank you for keeping us all “grounded” as we often leave the ground! Thanks! Still so excited a week later.